It’s been said time and time again. One of the most significant reasons behind Strange Music’s success is the seemingly non-stop touring that takes all of the acts across the country year in and year out. In 2011, Strange Music’s touring game was bigger than ever as Tech N9ne made his way to Canada while Krizz Kaliko and Kutt Calhoun stepped out on their own for the Strange Noize Tour 2011. Summer then experienced a heatwave thanks to the All 6’s And 7’s Tour, which boasted 82 shows in 85 days only to be followed by The Lost Cities Tour in the fall. From country to country and state to state, Strange Music took Strangeland to the people, one city at a time. With the year coming to a close, we’ve decided to take a look back at some of the most memorable moments from the road. The Strange Noize Tour 2011 once again brought together two of the most successful independent labels around as Strange Music and Suburban Noize joined forces to take their very best artists out on the road. Featuring Krizz Kaliko and Kutt Calhoun, the tour also included performances from Saigon, Potluck, Johnny Richter of the Kottonmouth Kings, and J Hornay. Allowing Krizz Kaliko and Kutt Calhoun to shine on their own, the tour was a huge hit with fans everywhere. 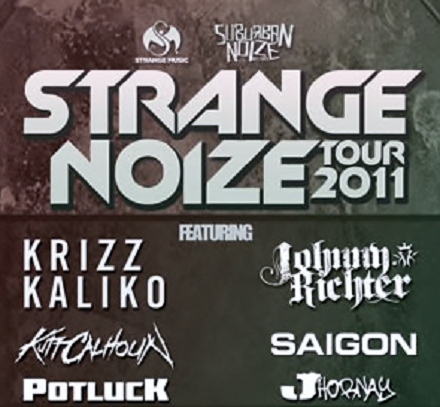 Did you attend the Strange Noize Tour 2011? What were some of your favorite memories from the tour? Share them with us in the comments below!